The Homer Tunnel slabs are 200m vertically above the tunnel portal on the Hollyford side. The crag is fast drying and sports two 200m metre routes, equipped with bolts and chain belays. The routes run between the prominent water streaks and if combined can give 11 pitches of excellent climbing. The slabs can be prone to rock fall from broken ground higher on the ridge. Wear a helmet and don’t climb if you can see threatening snow patches above you in springtime. Although both routes are primarily bolt protected, nearly every pitch requires at least some natural protection. Carry a set of nuts and cams #0.5 to #3. Anchors are rigged for abseiling although you will require two ropes. Both Rock Busking and Stage Fright share the same first pitches. 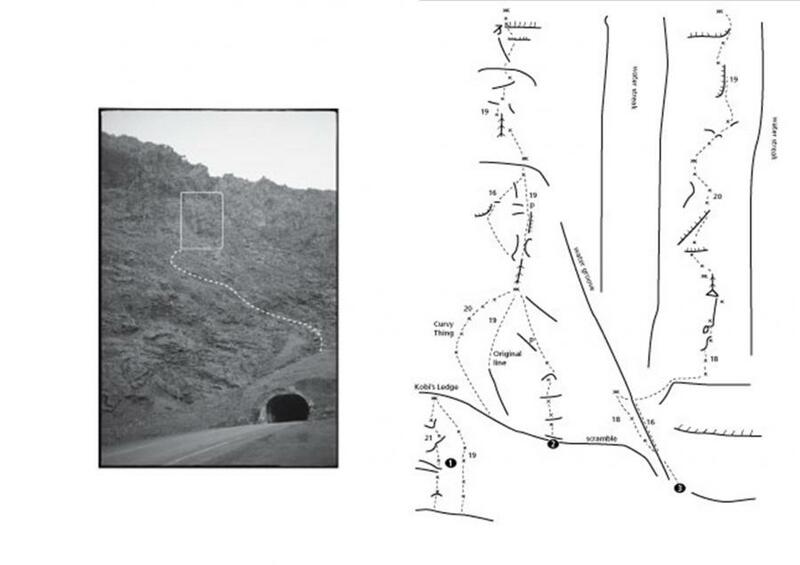 Climb up scree and grass slopes to the right of the tunnel (looking up) until you reach rock slabs. Traverse left on tussock and slab ledges gaining height up grassy gullies only when you are almost directly below and slightly left of the routes. Step back right to ledge and bolts. Both Rock Busking and Stage Fright share the same first pitches. Two alternatives exist and are common to both routes: Left hand line: 20/21, Sustained friction and thin face climbing. Right hand line: Morning Glory 18. A less intense start to the day. Careful at third clip. Jen Purdie, 1996. Interesting friction and face climbing. Sustained friction climbing with spaced bolts, moving right past the 4th bolt. Move 15m down and right to belay for Pitch Two. Up on natural gear, through small left facing corner to finish past two pitons and one bolt. Sam Bosshard, John Dainty, 1995. Alternative second pitch to Rock Busking. From Kobi’s Ledge trend right then curve back left to belay. All bolts. Sam Bosshard, John Dainty, 1996. Move right and up, across water streak to gain ledge and first bolt. Then head straight up. Excellent climbing. Move left at first bolt, up through layback corner then on to belay. Have a 1.5 cam ready.